In a recent survey of 54 representatives from African civil society organizations and community groups, 76% reported previously accessing technical assistance (TA) to support their engagement in Global Fund processes. The survey was conducted in March 2017 by the Regional Platform for Communication and Coordination for Anglophone Africa, hosted by EANNASO. The Regional Platform forms part of the Global Fund’s Community, Right and Gender Special Initiative (CRG SI). Improving access to TA to support civil society and community groups to meaningfully engage in Global Fund processes is a key objective of the CRG SI. Aidspan has been reporting on the CRG SI’s progress since 2015 (see GFO stories here, here, here and here). The survey is a follow-up needs assessment to one conducted in January 2016. Aidspan has previously reported on those results. The survey includes perspectives on civil society and community engagement in Global Fund processes from 18 African countries: Botswana, Ghana, Kenya, Lesotho, Liberia, Malawi, Mauritius, Mozambique, Namibia, Nigeria, Rwanda, Sierra Leone, South Africa, Swaziland, Tanzania, Uganda, Zambia and Zimbabwe. While 57% of survey respondents had heard about the CRG SI for 2014-2016, only 33% knew it had been renewed for $15 million over the 2017-2019 funding cycle (see GFO story). As the Fund has yet to issue requests for proposals for the next phase, this is not unsurprising. Fifty-six percent of survey respondents knew that they could request TA from the Global Fund CRG department and its partners, which is a slight improvement from the 2016 survey findings (52%). However, respondents from key populations organizations were much less likely (25%) to know they could access Global Fund TA, compared to respondents from civil society organizations (CSOs) (67%) – a finding that is consistent with the 2016 survey. This knowledge gap may be particularly pronounced for transgender communities. Indeed, among male, female and transgender survey respondents, people who identified as transgender were the least likely to know they could access Global Fund TA (33%). These results underscore the continued need to increase knowledge of Global Fund TA among key populations. 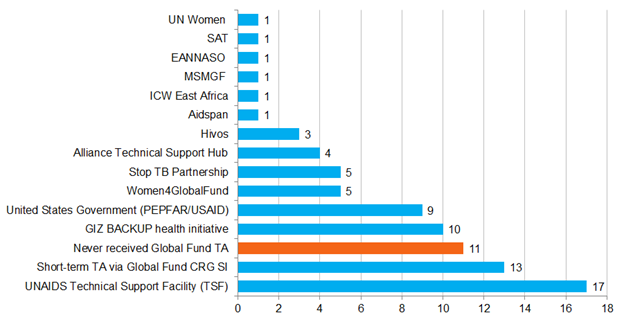 Among those who have accessed Global Fund TA, the most commonly cited provider was the UNAIDS Technical Support Facility (TSF) for East and Southern Africa, located in Johannesburg, South Africa. Almost a third of all survey respondents have access TA through the TSF at some point in time (see figure). “I can attest that more CSOs accessed TA through the TSF these past few months,” said Katlego Motlogelwa, a technical support consultant with the TSF. Motlogelwa told Aidspan that UNAIDS has been developing a more intentional strategy to increase TA for CSOs, including conducting a needs assessment and a holding a follow-up workshop (see GFO story). Despite the popularity of the TSF as one of the preferred TA provider in the region, there is some degree of uncertainty about its future. In January 2017, Mott MacDonald elected not to renew its contract with UNAIDS to continue managing the TSF. Mott MacDonald is an international consulting firm which has managed the TSF for the last two years. Following the expiration of an old contract in June 2016, Mott MacDonald proposed to manage the TSF for a further 12 months. However, UNAIDS only offered a six months contract, up until the end of December 2016. When that contract expired and UNAIDS wanted to discuss another extension, the company was no longer interested. The TSF is currently housed within the UNAIDS Regional Support Team (RST) in Johannesburg as an interim solution, with contract and payment processing running through the TSF for West and Central Africa (based in Ougadougou, Burkina Faso). The RST has set aside $1 million to support TA requests until July 2017, after which the future of the TSF remains unclear. Following the TSF, the second most common source of Global Fund TA is the short-term peer-led TA offered through the Global Fund’s CRG department, as part of the CRG SI. After the CRG SI was approved by the Board in August 2014, the volume of TA deployed grew rapidly. In just one year, the total number of funded assignments tripled, from 23 in March 2015 to 69 in March 2016 (see GFO story). By the end of 2016, the CRG SI had invested nearly $5 million in more than 100 TA assignments. The types of assignments include, among others, reviews of disease-specific national strategic plans, consultative meetings during funding request development, and human rights and gender audits of draft funding requests. Respondents also reported accessing Global Fund TA from the GIZ BACKUP Health Initiative, the U.S. Government, Women4GlobalFund and the Stop TB Partnership. While this survey suggests that the majority of respondents have accessed some kind of TA to support their Global Fund engagement, it is noteworthy that 20% report never having accessed any TA. As the Global Fund aims to increase its investment in CRG TA – to $6 million during the 2017-2019 funding cycle (see GFO story) – more may need to be done to stimulate demand. Lastly, the survey sheds light on what kind of TA may be most needed by civil society and community groups. Survey respondents were more confident in their ability to engage in the development of funding request than they were in their ability to perform effective community monitoring during grant implementation. TA for community monitoring has historically been scarce. During the 2014-2016 funding cycle, most TA – including that which was available through the CRG SI – was only available up until the grant-signing stage. Going forward, the Global Fund’s CRG Strategic Initiative (2017-2019) will make TA available throughout the funding model, including during grant implementation. This will create greater opportunities for civil society and community groups to access community monitoring TA.